Happy New Year! As 2014 is barely starting, I wanted to look over my running last year. What races did I do? What did I like or not like? What will I do again and what will I change as I plan my race calendar this year? So here it is! My race highlights of 2013. I look forward to many more once I heal in 2014. 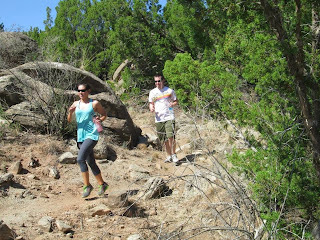 Trail running with my brother on the newest trail, Rock Garden, in Palo Duro Canyon State Park. For my birthday this year, I wanted to get all my favorite girls together to do my favorite thing: a women’s only race. 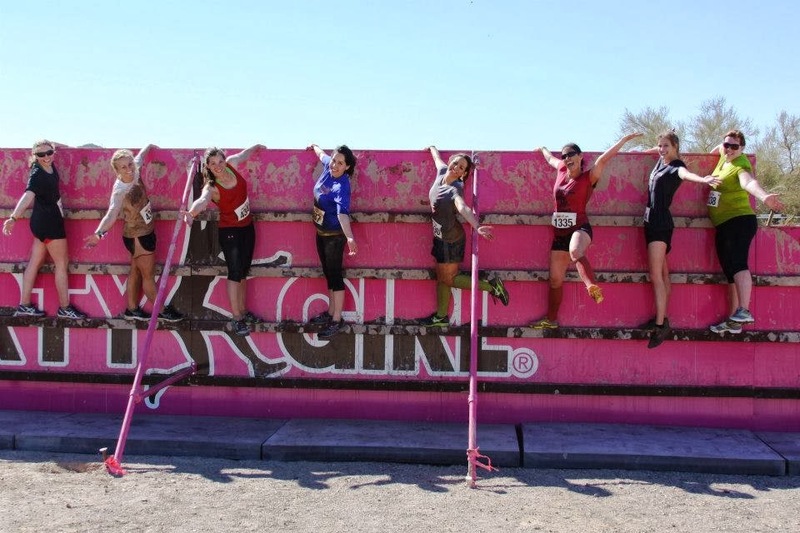 Since my best friend lived in Tucson and I hadn’t seen her in over a year, I found the perfect event right in her city—the Dirty Girl mud run obstacle course 5K. Five of us drove from Eastern New Mexico, one from West Texas, and two were already in Arizona. We all met up, had a great dinner, then planned out our racing strategy (stick together, pose for the cameras, and have fun). Best. Birthday. EVER! I can’t think of a better way I could ever spend a birthday again. Although, for advertising a “mud run”, there wasn’t much run. It was more like dirty sand, so we completed the race fairly clean. And I learned that shorts are not the best idea for this type of race. The obstacles were well staggered, the course was pretty, and we danced and splashed in the mud like a bunch of kids— such a great time! Needless to say, my 2014 birthday race-cation is already in the planning stages. left to right: Molly, Shelly, Jenna, Carol, Cammie, Me, Erica, and Erika. My best friends from 3 different states all came out to Arizona with me to do this race with me for my birthday. I love all of them! My April race was a milestone in my running journey, my first 10K. The local air force base organized the Run for Heroes 10K benefiting the Wounded Warrior foundation. With June at a babysitter’s, I was distraction free and ready to focus. Aside from my MP3 player dying on me at the 4-mile mark, the race was uneventful, but the spirit of the run was incredible. Running in honor of those who paid such a heavy price in the line of duty really gave me a new perspective on my run. The pain I usually feel under heavy exertion was minimal in light of the sacrifice others had paid. My goal time for this race was to beat 75 minutes, but I finished in 58:34 easy. Goes to show that when your mind isn’t focusing on all the little nuances of running—muscular pain, respiratory exertion, chest pounding, fatigue, etc—then you can accomplish things you never thought possible until that moment. Earned my first 10K medal while wearing the 'party shirt'. I think I confused a few people. I kept getting weird looks, then they would say "oh, it's a shirt!". I also got a few high-fives because of it. Labor Day weekend, I took a trip to Dallas to see my friend Amie. She also is addicted to races, so we signed up as a partnership to compete in the Fort Worth Diva Dash, a women’s only obstacle course 5K with no mud. In preparation, we purchased matching American Dream (the female version of Captain America from Marvel comics, and yes I know this because I’m a comic book nerd!) outfits. The race expo had so much to look at, eat, drink, do, and buy—and all geared toward women. It was like a fitness mall had been built overnight in a park! I may have spent a bit of money on new running apparel and gear J. The race itself was one of the best courses for beginners I’ve seen. The obstacles were all accomplishable as each one had a beginner route and a challenging route. Amie and I took the challenging course on all but one, the monkey bars. It’s been way too long since I’ve dominated that playground game, especially with the bars covered in a slick layer of dew. We were hauling and finished the race completing every obstacle, in 26:22, my fastest time ever especially with the added events! Amie pushed me hard during the run, she’s super fit and super fast. And to complement her speed, I pushed her hard on the obstacles since I’m more strength-oriented and I excel in that area. Together, we were unstoppable. Diva Dash is now in my top 5 favorite race series and I will signing up for another one next year. The matching team costumes made it even more epic. Amie, June, and I at the finish line after completing the Diva Dash. The city of Clovis New Mexico has a big pioneer day celebration every year complete with parade and festivities. The day starts off with the Pioneer Days 5K which is an out-and-back course that encompasses the entire ‘historic Main street’ and loops around a duck pond. It’s not a bad run, unless the wind picks up. Then it’s almost like you’re running standing still. 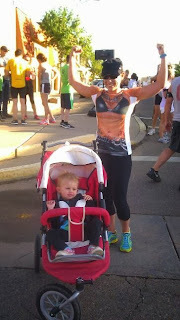 I ran this 5K with my friend Molly and I was pushing my 2-year old in the jogging stroller. Though it didn’t feel like we were going that fast, we were passing runners. My daughter wanted us to stop at the pond so she could see the ducks, but we pushed through because the wind was hitting hard on the ‘back’ part of the route. As the stroller got heavier and heavier to push, I maintained my pace somehow. We crossed the finish line in 28:02—my 5K Personal Record (PR) while pushing a stroller. I definitely felt accomplished and had a great time with my friend and my daughter. Victory! And my 'party shirt' was a hit. Baby girl was so good the entire run. 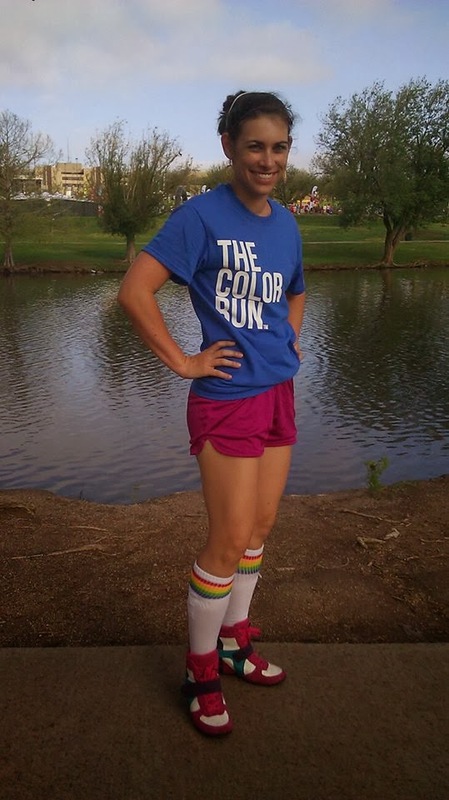 The Color Run came to West Texas lat in June, but for this race I thought I would give back. I volunteered and ended up helping out at the merchandise tent. The ladies running it were so sweet and so thankful for the help since that tent was insanely busy until about half-way through the wave starts and most of the runners were on the course. The energy was high and everyone had a positive attitude. It felt really great to help out at a running event when I’d always been one of the participants. Although after volunteering at a Color Run and observing all the fun, I now absolutely must run one! I wanted to dress colorfully for this volunteer opportunity. 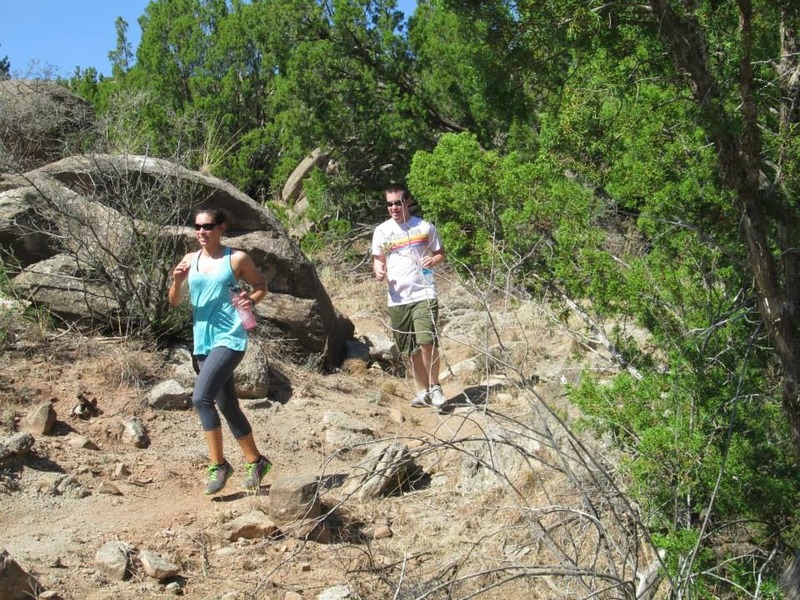 I live near the gorgeous Palo Duro Canyon, hence this scenic park is the backdrop to much of my spring and summer training. 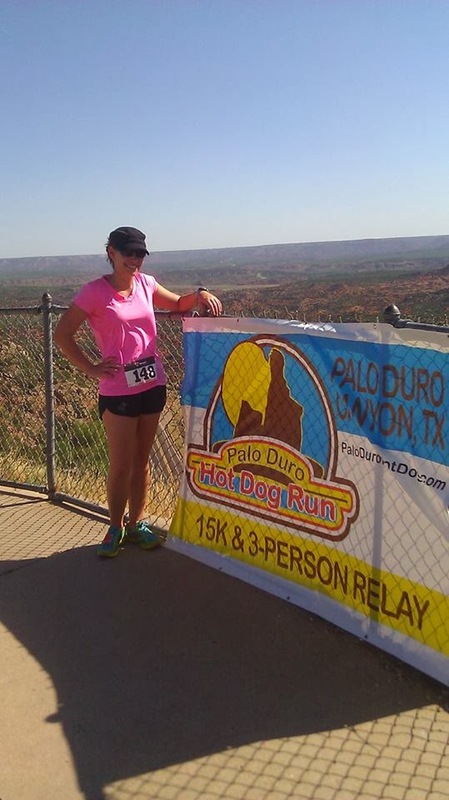 So, when I saw advertisements for the Palo Duro Hot Dog Rim-to-Rim 15K, I signed up with bells on. I figured I’d been running 10 miles no problem (on level ground), this would be a nice, maybe slightly challenging training run for my upcoming half-marathon. Little did I realize how much running downhill, especially at a 5-9% grade for the first 5K, would physically hurt and hamper my progress on any other terrain. My knees, glutes, and hamstrings were on fire half-way through the 2nd 5K, on the level-ish canyon floor. And the final 5K—the 5-9% grade uphill—was utterly brutal. That last third took me longer to complete than the previous distance I had just completed. I barely jogged past the finish line and hurt for 2 solid weeks after. Though the scenery was beautiful, the race well organized, delicious food at the finish, and pretty awesome finisher medals, I should have taken this race much more seriously. I’ll definitely train better next year. From the top of the ridge where I'm standing, you can see the entire race course. August was the pinnacle of my 2013 running venture. 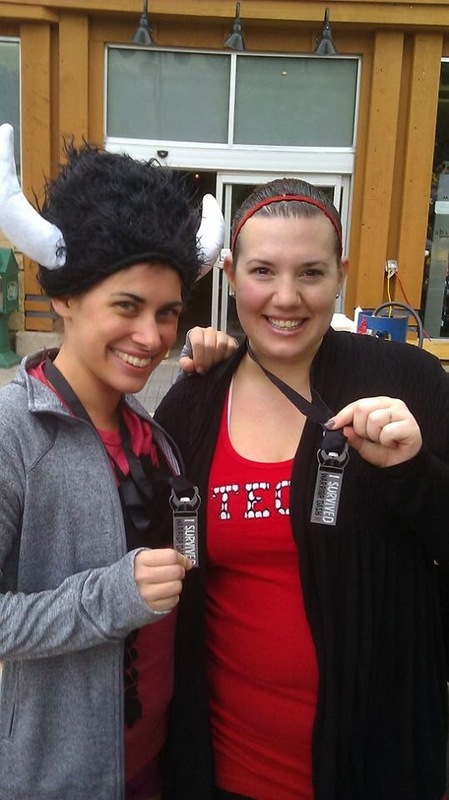 My friend Erika and I planned a Colorado-Utah double race-cation consisting of the Warrior Dash 5K mud run obstacle course the first weekend and the Utah Runner Girl’s Half Marathon the following weekend. 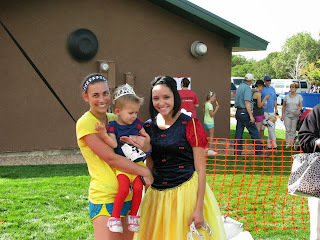 This would also mark my daughter’s very first race ever (not in the stroller), the Utah Runner Girl’s Princess Mile. She was so excited about running her very own race, just like Mommy. First was the Warrior Dash. Waves of runners were starting at 30 minute intervals from 7am through 4pm. Our wave was at 3pm, so we were one of the last to go. The Warrior Dash was easily the most challenging of mud run obstacle courses I’ve completed yet. I discovered that, yes I am afraid of heights atop of one incredibly tall obstacle. I was covered in mud and the thick rope I was supposed to use to repel down this wall was slick with mud. 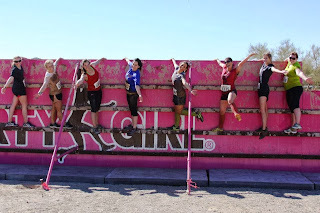 If it weren’t for the encouragement of the people both at the start and end of this obstacle, I might still be nervously frozen straddling the wall. The participants were friendly and ready to help each other at the first sign of need. This race undeniably tested me to the brink of my strength on the obstacles. So, when we reached the last one, the fire jump, I felt invigorated and powerful! Without skipping any challenges, Erika and I leapt over the fire and crossed the finish line victoriously, hands grasped together and raised in triumph. The party atmosphere was incredible: music blasting throughout the race grounds, people dancing near a concert stage, booths scattered all around selling warrior-themed merchandise, and foot carts handing out massive turkey legs. It was easy to tell who had run the race and who hadn’t. About half the people there were either caked in mud or, if they had reached the shower, were sporting flecks of mud throughout their hair. The combination of physical challenge on the course, fellowship of the runners, and spectacular after-party, the Warrior Dash has also made it in my top 5 favorite race series. Erika and I sporting victorious smiles, viking helmets, and race medals after completing the warrior dash. We had just finished rinsing off and changing. Just a few minutes prior we were caked head-to-toe in mud. The “Most Beautiful Scenery on a Race Course” award goes to the half marathon I ran the following weekend in the neighboring state, Utah. The Utah Runner Girls Half Marathon is a point-to-point course. Where I was anticipating many inclines and running UP mountains; we actually were bused to the starting line which was at the top of one of the smaller peak in Alpine. The first 5 miles of the race were down the side of a mountain. I had a repeat experience of pain from the Palo Duro 15K. The downgrade was hard on my knees, hamstrings, and glutes. When the course leveled out and started to include some small hills, I couldn’t crest them and I ended up walking most of the distance from mile 5 to the finish. This is how I injured my knee – all the unprepared downhill running. Now, aside from my poor training judgment, the race was wonderful. I've never seen such beauty! On the run down the mountain, I could see the Great Salt Lake framed by the Rocky Mountains with--no kidding--a rainbow over it! 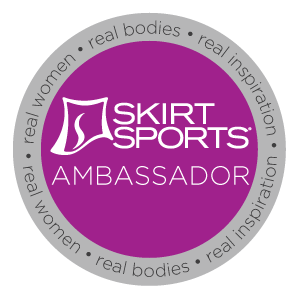 The camaraderie of the women runners truly impressed me. Many were there with an encouraging word, a high five, a pat on the back. The volunteers at the water stations along the route were genuinely proud of every runner and glad to be there to serve us. Then, at mile 8, there was a “Chocolate Mile”. Ghirardelli chocolate, chocolate Gu’s, and chocolate of every form were passed out in handfuls at this water station. I think the sugar of that chocolate bar gave me the energy to finish. I was able to sloooowly jog across the finish line. I think my legs and hands swelled to almost twice their normal size because I felt so sluggish and awkward. I won’t lie, this race was painful as most distance running can be. But when that cute fireman placed my medal around my neck and told me “well done”, I was beaming with pride and thinking about what race I should do next. About 15 minutes after I finished, the little girl’s Princess Mile began. Girls ages 2 (my daughter was the youngest there) through 12 were lined up adorned as their favorite princess. June dressed up as Snow White in a homemade costume done by my brother. She just wouldn’t wear the headband. The race began and June firmly grasped my hand and dragged her exhausted mother through her entire race. Erika and Jessie also joined us and we all got to watch my baby girl cross the finish line of her first race. She was crowned at the finish by the very princess she was emulating that day. My little princess at her very first race. October means two things to me: Halloween and zombies. 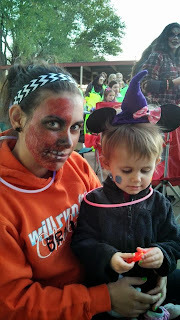 So, when those two things are merged together in an epic way, an Electric Zombie 5K Race around Halloween, I was there. I made-up half of my face in zombie paint, wore my “Will Run for Chocolate” sweatshirt with tape covering “Chocolate” and replacing it with “Braaaains”. The registration desk passed out all sorts of light-up add-ons so I was sporting a few neon necklaces and bracelets as I ran. My MP3 player was blasting Halloween themed songs with tunes making me fly around the out-and-back course. This was my first night run and my first electric run. Those two go well together. I loved the experience of running in the dark, it was exciting. 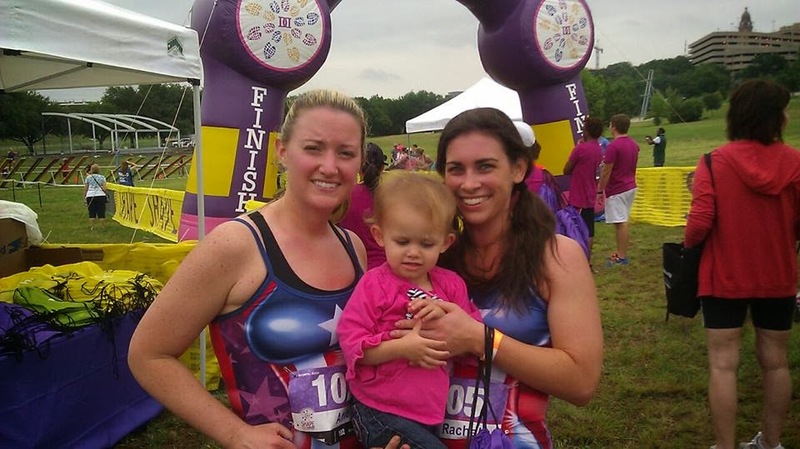 When I neared the end, my daughter was walking out to greet me with my friend Molly and they joined me at the finish. June kept looking around at all the “zombies” in the dark and saying “It’s spooky in here!” This race brought the spirit of Halloween full force. Adorned in glowing accessories and waiting for it to get dark. 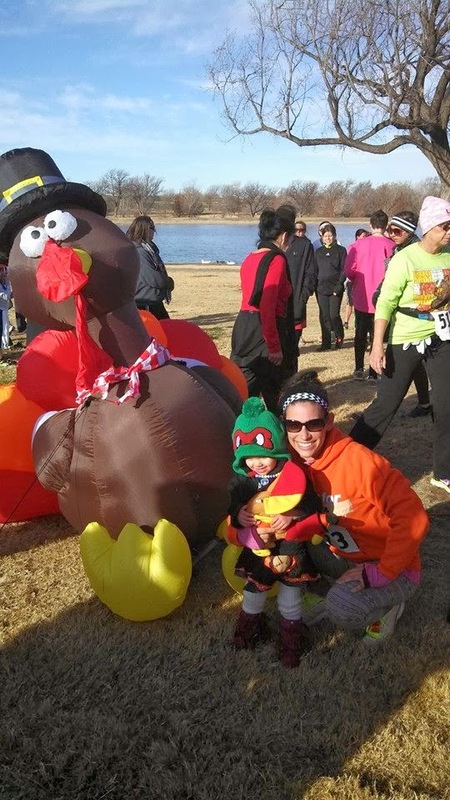 Alright, my last race this year was a 5K Turkey Trot held the morning of Thanksgiving. I can think of no better way to start this holiday than a run with family and friends. 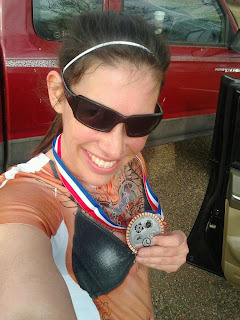 It was chilly and I decided to run on an empty stomach (not one of my better choices), but the race was fun. You could feel the anticipation of a large meal in the air. Turkey trots put me in a grateful mood. As I run I focus on how I’m grateful that I have a strong body that can carry me on my own power over 3.1 miles. I think about how I’m grateful for the fall weather, the companionship of family, my wonderful friends, etc. Thanksgiving makes me more mindful of being thankful. We had to get a picture with the giant turkey at the finish. And, yes, June is wearing a Ninja Turtle beaning while carrying a stuffed turkey. - 1) I love running with a buddy/buddies. - 2) 5K’s are low pressure and can be a lot of fun, especially around the holidays. - 3) I think I’ll make 10K’s my new competition distance. - 4) Although I have a fear of heights, I can still dominate an obstacle course run. - 5) Costumes are a must-have for running with a group as they add to the festivity. - 6) Check out the course elevation so I can better train for downhill running. - 7) Be better prepared in general and stick to my training plans. - 9) Figure out how to take a better race picture. What are some things you’ve learned during a race? I’d like to apply your advice to my 2014 race calendar.